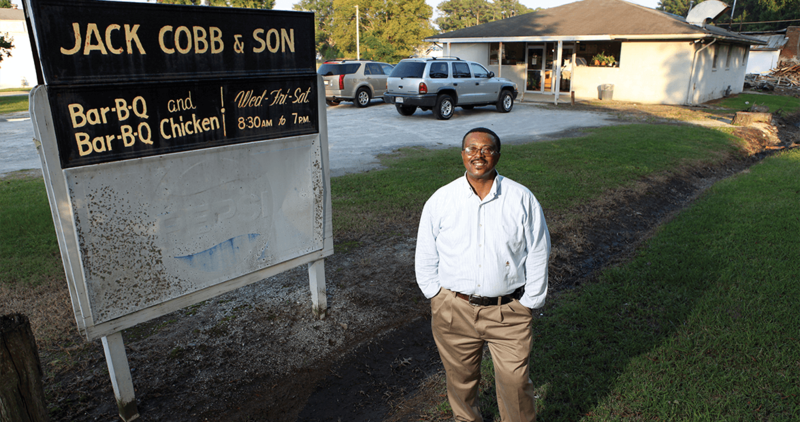 How a father-and-son business brought pit-cooked barbecue — and unity — to one eastern North Carolina town. When Jack Cobb started selling barbecue from his car, he knew he was taking a risk. He knew that in the 1940s a black-owned business like his would be difficult to make a success. But when workers at A.C. Monk Tobacco Company in Farmville started visiting his car — parked outside the plant — to buy his barbecue, he felt he was on to something. Jack learned how to cook barbecue growing up on a farm, where his family roasted hogs in a dug-out pit lined with tin and kindled by corncobs. He knew the skill but not the business. That part he figured out along the way. Jack began loading barbecue plates in his car and drove all over town with his son, Rudy, who would run plates from the car to the customers. This practice appealed to white customers, who wanted Jack’s barbecue but wouldn’t visit a black-owned business. On each trip, Jack and Rudy sold a hundred plates of barbecue, corn bread, and slaw for 65 cents each. They made enough money to send Rudy to college at North Carolina A&T State University in 1959. Rudy later served in Vietnam, but afterward, he returned to Farmville in 1966 to help his father run their barbecue business. In 1971, Jack and Rudy built a cinder-block storefront on South Main Street in Farmville, where they started selling barbecue three days a week. It was progress from their days selling barbecue from a car, but with the racial turmoil of the ’60s still fresh, Jack and Rudy didn’t put in a dining room, only a counter, where customers could place and receive their orders. That decision didn’t affect business, because folks came, and still come, to Jack Cobb & Son Barbecue. Rudy, 72, now operates the business without his father, who died in 1989. He honors his father’s memory by serving the same quality, pit-cooked barbecue. Inside the smokehouse, behind the restaurant, the white walls are stained gray with soot from decades of burning charcoal and oak and pecan wood. Rudy starts a fire by loading a hearth with kindling and green logs — dried wood burns too quickly, and it doesn’t impart a good flavor, he says. He prepares hogs by wrapping them in foil, and then he and an assistant lift them up onto the pit’s cooking grate. Rudy covers the pit with large panels of corrugated roofing, leaving enough space for him to shovel in glowing red coals from the hearth. Rudy periodically checks the pit, gauging its temperature by hand, never with a thermometer. Unlike some eastern North Carolina barbecue restaurants, Rudy serves chopped barbecue free of skin and fat. But like the others, he cooks the whole hog and douses it with a vinegar-based sauce. In addition to pork, he serves barbecued chicken and turkey barbecue. As the weatherworn sign outside indicates, barbecue is served on Wednesday, Friday, and Saturday. Rudy starts cooking around 3 p.m. on Tuesdays and Thursdays, pulling the meat from the smokehouse the next morning. He starts cooking earlier on Fridays, around 8 a.m., so he can work the counter most of the day on Saturday. “A lot of folks look forward to barbecue on Wednesdays, and they may even go back on Friday or Saturday,” says longtime Farmville mayor Bobby Evans. 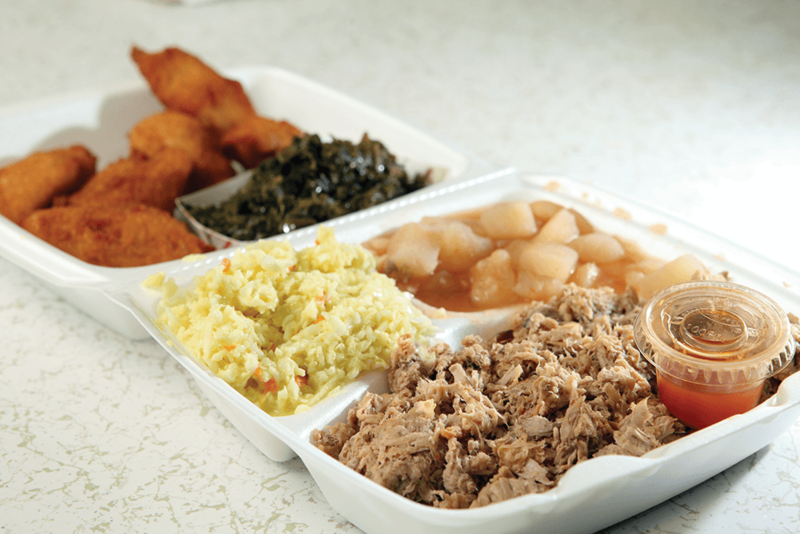 About 30 pit-cooked-barbecue restaurants remain in North Carolina. Of those, only a handful are black-owned, according to Jim Early, founder of the N.C. Barbecue Society and author of The Best Tar Heel Barbecue: Manteo to Murphy. It’s easier and more profitable to use a gas cooker, Early says, so places like Jack Cobb & Son are a vanishing treasure. Rudy knows it, and he’s considered retiring from the business himself. “I don’t know if my body is going to hold another four years running a barbecue place,” he says. But something keeps him coming back to cook barbecue the way his father taught him to — though there is one difference between Jack’s method and Rudy’s. Rudy doesn’t turn his hogs. He says his job is hard enough without having to flip a couple of 120-pound hogs. Jack questioned Rudy when he suggested they skip turning the hogs. But before he died, Jack gave the practice his blessing, saying the meat tasted just as good. His customers didn’t notice, either. They still love the barbecue. They always have. Wednesday, Friday, and Saturday, 8:30 a.m.-7 p.m.
Bobby Burns is the online editor at The Daily Reflector in Greenville. Why Is the Best Fried Chicken Often Found at Barbecue Joints?